So hence the reason I am writing you. I clocked myself today for about 10 swings and the fastest swing was 115, then I got on the Somax hip trainer and worked out on it forten minutes. I got off the machine and I felt really good. I then hit balls and couldn't believe what I saw. My first swing was fast at 118 and I was excited. Then it happened, my next swings were 121,127,122,128 , and 124. I leveled off at 122 smooth and topped out at 128.
vates me to keep working on it all winter. Although I have not been able to compete in 2007 due to a skiing accident which required surgical intervention, I wanted to let you know how much I enjoy and value yourPower Hip Trainer. When you first tested my hip strength I wasshocked to find that my hips were very weak, even though I am a professional golfer competing on the LPGA Tour. I was alsodisappointed because I had spent 10 years strengthening my body with various fitness 'gurus', yet none of themspecifically trained my hip rotators. They were more concerned with the other muscles. As a result of over-training with weights, I developed a lot of scar tissue, which you had to release so that I could make a full swing. Since I have started to work with the Power Hip Trainer I have gained about 10 yards with the driver and I am starting todraw the ball vs. putting a weak cut on the ball which used to create a lot of backspin. Now my ball has less backspin which makes the ball roll out a lot once it hits the fairway. I have been playing scratch golf for more than 30 years and was not happy to see my average drive drop from 250 to 230 over the past few years. The combination of Microfiber Reduction and the Power Hip Trainerhas enabled me to increase my average drive to 280, with some drives going as far as 300 yards. At 57 years of age, I am very pleased with the results. The Power Hip Trainerhas been a big help to my students. The resistance and acceleration really help them work the muscles in their legs and hips. Talking about hip rotation, showing them tapes of expert golfers, and demonstrating the correct motion myself has not helped them to learn how to drive with the legs and rotate the hips like thePower Hip Trainer. Amazingly, as I continue to train with Somax, my hip action just gets stronger. Once I am loaded up on my right side, I can’t wait to pull the trigger and fire my right hip right at the target. Can YOU pass these golf hip strength test? Sit in a chair and turn your shoulders back to your right (to the left if you play left handed). Have someone stand behind you and grab the front of your right shoulder with their right hand and push against the back of your left shoulder with their left hand. 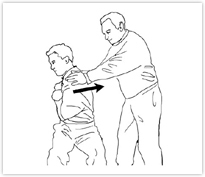 As you turn your shoulders back toward center, have them resist, as you see here. If you're like most golfers, you can easily turn your shoulders back to center. This is because you use your stomach muscles to power your downswing. Your stomach muscles (obliques) are paper-thin, but with enough practice, they can become fairly strong. Still keeping your knees together, move your feet away from each other. 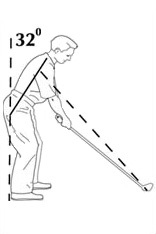 If you have enough flexibility in your hips for golf, you should be able to move your feet apart a total of 120°. That is 60° on each side, as you see in the drawing. A simple and accurate way to measure is to have someone get down on the floor and take a photo your legs in this position. Then get a print of the photo. As shown above, draw vertical lines through your knees, a line through the center of each lower leg, and measure the angle between the two lines with a protractor (available in any office supply store). Be sure to take the time tomeasure. Don't try to guess! These are the largest muscles in your body (that’s why the biggest of them is called 'maximus'). If you're like most golfers, you will not be able to bring your feet together at all. If you can bring them together, it's only with a lot of effort. How do weak hip muscles affect your game? If you have discovered, with these 3 simple tests, that your obliques are stronger than your hips — that means you're using your obliques to power your downswing. And that's undermining your handicap. Research proves a direct relationship between hip strength and handicap. A study of 82 golfers by researchers at a highly respected university lab found that players with the lowest handicaps had the strongest hips. The 82 golfers were divided into three groups, based on their handicaps. Researchers found that greater hip strength was related to a better handicap. 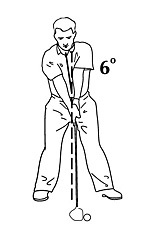 And the best players, those with a "scratch" or better handicap were stronger in all hip movements. Here is a link to this research about hip strength and handicap. On the other hand, despite decades of golfers and teachers advocating sit-ups and 'core' work, not a single study has found a relationship between strong obliques and a low handicap. That's because strong obliques wreck your accuracy, forcing you to compensate with your hands. There are the two major reasons that weak hips (and strong obliques) prevent you from lowering your handicap. When you contract your obliques, you also pull your head and shoulders down during your downswing. Mis-aligning the body during the golf swing. Pulling your head down makes good ball contact harder. The distance between your eyes and the ball changes, so that sometimes you hit the ball a little thin, other times you hit fat. 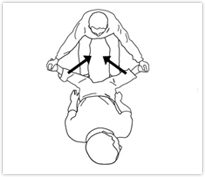 You also have to change your spine angle to compensate. If you don't 'stand up', you will ground your club. As you know, being just a little bit off center makes a big difference in how far your ball travels. You can’t lower your handicap if you're striking the ball with all parts of the club face. You have to hit it dead center. What happens when you pull your head down? 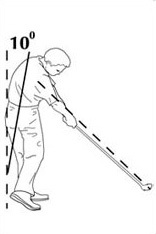 You attempt good ball contact by changing your spine angle. Some times you can change your spine angle just the right amount to hit the ball with the center of the sweet spot. Sometimes you change it too much and you hit it thin. Sometimes you don’t change it enough, and you hit it fat. Some days, you alternate all three. driving yourself crazy. When you contract your obliques, you also tilt your spine to the right before impact. Increasing your front spine angle opens your club face just prior to impact, as you can see by holding your driver at address and tilting your upper body to your right. An open club face pushes your ball to the right. So what do you do when your obliques open your club face? You attempt to square your club face with your hands. Some days you can square the club face and the ball goes straight. Some days you overdo it, and the ball goes left. Some days you don’t square it up enough, and the ball goes right. Some days you do all three, which is why you 'pray and spray'. Since you don’t know that you are using your obliques to power your downswing because your hips are too weak to get the job done, and because you don't know that your obliques are distorting your spine angle, you may blame your ball flight problems on your mind. Your mind is not to blame. We have a tendency to think that golf is mostly mental — but is it? When your hips are stiff or weak, and you're not aware of it, you may think your golf problems are mental when it's really your stiff, weak hips that are causing erratic swing problems. If your hips were strong, wouldn't you use them to power your downswing? Of course you would. You wouldn't have to use your paper-thin obliques. Your strong hip muscles would enable you to make a powerful rotation without changing your spine angle or pulling your head down. The result? Longer, straighter drives, woods and irons. As your hips get stronger, you'll find that your mind really is OK, because now your shots go where you're aiming. All because you strengthened your hip rotators. But how do you strengthen your hips? Should you lift weights? Weights are not the answer. Lifting weights won't strengthen your hip rotators. We know, because we've done the hip rotation strength test with many competitive weight lifters. They turned red with embarrassment when they found we could keep their feet apart with just our finger tips! Worse yet, lifting weights creates scar tissue that makes your hips stiffer. We know that lifting weights creates scar tissue because we've spent countless hours with professional golfers releasing scar tissue from their hips. This scar tissue was caused by running and lifting weights. How do you strengthen your hips for golf? Well, obviously, most golf training aids are not going to work. 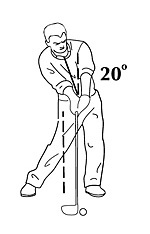 Heavy clubs, weighted sticks, clubs with air-resisting vanes‚ these all strengthen your arms and obliques, not your hips. 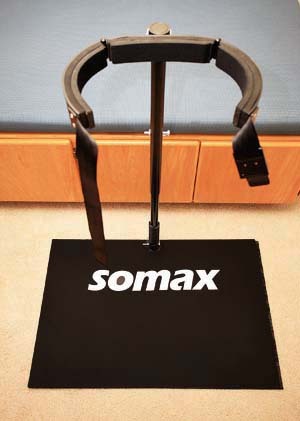 There is only one golf training aid that strengthens your hip muscles... the Somax Power Hip Trainer. Designed with golfers in mind. The developers of free weights, weight machines and 'core' workouts had no idea that scratch golfers owed much of their success to powerful hip rotator muscles. They were either unaware of the study showing a relationship between hip strength and handicap--or they chose to ignore it. It's only from our years of working with amateur and professional golfers and testing their hip rotation strength that we were able to see for ourselves the importance of hip strength to handicap and then develop a machine thatenables every golfer to develop this powerful, hip strength secret. Did you know that it just not in golf that powerful, fast hips are the hallmark of dominance? The fastest hips in boxing belonged to Muhammad Ali. The fastest hips in baseball belonged to Barry Bonds. The fastest hips in golf belonged to‚ Tiger Woods. The reason that hips are the key to sports dominance is that they generate thegreatest force with the least effort. As we learned in school, Force = Mass X Acceleration. The biggest, most massive parts of your body are the hips. The force you generate by accelerating the mass of your hips is transferred by your trunk and arms to the club ‚ and then the ball. By generating the power for your swing with your legs and hips, rather than you obliques, you're free to use the smaller muscles of your arms to keep your club on plane and keep the club face square prior to impact. And you don’t have to compensate for a changing spine angle because you don’t have to use your obliques. Big muscles for power. Small muscles for guidance. It is as if nature designed the body for golf. But abuse that design and you're asking for trouble. When you use your upper body for power, you abuse that design. It's like driving a Ferrari off-road. The Ferrari is a beautiful car, but it wasn't designed for off-roading. The same with your obliques. They weren't designed to generate power. They were designed to transmit power. Your hips were designed to generate power. This is why I call my golf teaching aid the 'Power Hip Trainer'. It trains your hips to be more powerful, so you have a more powerful, consistent and accurate swing. The Somax Power Hip Trainer consists of a steel base and padded hip cinch with a powerful spring in the back which provides resistance to hip rotation, helping you to develop fast, powerful hips. Want to see again how easy it is to set up and use my Power Hip Trainer? The weaker the hips, the higher the handicap. Last year at the PGA show, we tested the hip strength of more than 100 PGA professionals who visited our booth. Of those 120, only two had enough hip strength that we couldn't keep their feet from coming together. To demonstrate that hip strength has nothing to do with age, one of those two pros was 65 years old. The other pro was 25. Besides strong hips, these two PGA professionals had something else in common. They both had the best handicaps. Both were plus 2 players. For the rest, we found that the weaker the hips, the higher the handicap. Just turning your hips during your swing doesn't mean you're using them to power your downswing. For 98% of golfers, the hips are just ‘going along for the ride’. In fact, many golfers and teachers talk about 'clearing' the hips, as if their only importance was to get them out of the way of the hands! Only if your hips test stronger than your obliques, are you using them to power your downswing. When we need to score in baseball, we always go to the strongest batter in the line up. We wouldn't go to the weakest batter for a home run. It's the same with your brain. Your brain always goes to the strongest muscles to make the swing. This means that if your obliques are stronger than your hips, your brain will choose to use your obliques. You have no conscious choice in the matter. You can’t ‘will’ yourself to use your hips. Therefore, you have to either make your hips stronger than your obliques, or else continue to ‘pray and spray’. You need a strength training routine for your handicap, as well as your distance off the tee..
Start your journey to longer shots and lower scores by ordering your Power Hip Trainer right now. My Power Hip Trainer comes with a one-year warranty on parts and a 30-day money back guarantee. You'll have a home machine that gives you an aerobic workout while improving your golf game. Looking for a golf gift idea? The Power Hip Trainer make a great golf gift! Quality construction backed by an iron-clad guarantee. The Power Hip Trainer is designed for years of service. It's made from the finest steel and finished with a baked-on rust-resistant enamel coating. The base has a special non-slip surface. Finished entirely in black, it will make a handsome addition to your exercise room, or it can be quickly assembled and disassembled for every-other-day use. Your Power Hip Trainer comes with a one-year warranty on all parts. If anything should break (nothing has so far), just return the part for a cheerful,prompt replacement. It also comes with a 30-day money-back guarantee. If, for any reason, you are not happy with the results from using your Power Hip Trainer, just contact us for a return authorization. Once we've received your hip trainer in resalable condition, we will issue a prompt refund, less shipping. I know, because I suffered a heart attack myself. I thought I was in good shape. I biked hard on the weekends, even taking my bike to Europe for a couple of weeks every summer. But I had a heart attack because I didn’t exercise every day. If you're like me, you work long hours in order to enjoy playing golf. But walking the course isn't enough. You need aerobic exercise. But where do you find the time? You could run at lunch, or take your bike to work. But, let’s face it, is that realistic? And if you run, you should be aware that running creates scar tissue in your hips that will make them stiffer. And stiff hips don’t turn fast enough for golf. The answer is our Power Hip Trainer. Your Power Hip Trainer comes with a DVD containing 26 drills for right and left-handers. The drills will combine into a vigorous one hour aerobic exercise workout. Now you can train the heart of your swing (the hips) while you train your heart! You bet it does! By exercising every day, I've lost 40 lbs of fat. My triglycerides have dropped from 350 to 77. My cholesterol has dropped from 225 to 173. My top speed on my bike rose from 20 mph to 22 mph ‚Äî a 10% improvement. I’m in better shape than I was ten years ago. I now have more endurance and more power. My regimen is simple. I use my Power Hip Trainer every other day for an hour, and I ride my bike for an hour every day that I don’t use my Power Hip Trainer. When you order my Power Hip Trainer, I'll send you, at no additional charge, bi-weekly emails to help you get the most out of your new machine. I want you to be successful with your new Power Hip Trainer. I realize, from my own experience, that it's one thing to buy a new training aid, read the manual, watch the DVD, and then start working with it, but it's even better when someone with experience shows you how to use it. The hip trainer is simple, but getting the most out of it is an ongoing process. My bi-weekly emails will help you. Order your Power Hip Trainer now and you'll soon have a convenietn home machine that gives you an aerobic workout while improving your golf game. If you found that you have less than 60° of internal hip rotation on each side, then you'll be interested in my Microfiber Reduction program. Microfiber Reduction is a special program that increases flexibility far beyond what stretching alone can do. Tour players who have completed my Microfiber Reduction program have won the US and South African Opens, improved their ranking in putting from #113 to #1, increased their longest drive from 295 to 400, and quadrupled their tour income. See how Microfiber Reduction can improve your flexibility.